This photo was taken on December 24, 2015 at 10:16 AM. The location was in downtown Washington DC. The "Take It!" came from my having just bought that last Christmas Present and was on my way to my car. 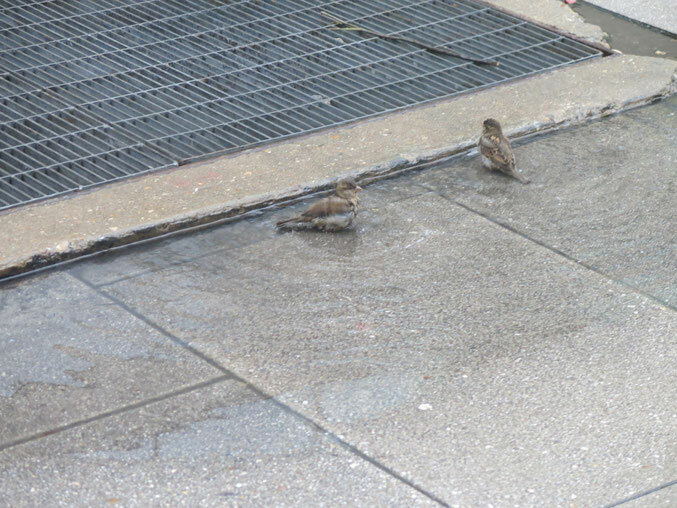 I happened to pass by these sparrows having a bath in an indentation in the sidewalk during this unseasonably warm day. They did not take long to have their rinse off and took flight soon there after. I had hoped to be able to catch an action shot with the drops of water still in the air as they do their spread the wings and fling it about, but no such luck. The After Take: This is an example of "the eye of the beholder." While we as walking stand up humans might look at this as a puddle to walk around and avoid, maybe with a subconscious thought of "they should fix the sidewalk." The birds see it quite differently. For them - it was a chance to spiff up in some recently fallen rain water. I have no idea if they feel better having had a chance to do this, or it serves some other sort of basic benefit for the bird that makes its life better - but given the opportunity to engage it - they do. We share so much with other living creatures that to take a moment to watch them sometimes can be a joy. Another example of this, is the viewing of a deer leaping over a fence, is a thing of beauty, especially when there is a group of them that are doing it almost all at the same time. It is one of those movies that are forever in my mind, waiting as a ready reference whenever I want a vision of a calming nature. Here is hoping you happen upon many such things of nature to add to your own mental film library. In the 3 years I have been frequenting this site, I think this is the first animal photo I've seen. Let me just say, I LOVE IT!!!! It is adorable! My wife and daughter took one look at this picture and ran outside to put water in the, long dry, bird bath. How freaking cute is that? Thanks for adding google+ to the list below. I tested it with these birds and it worked perfectly. Love this shot of a makeshift birdbath. Good eye!